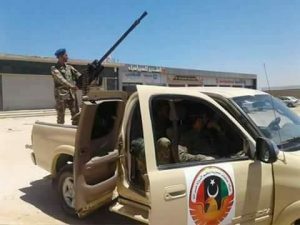 A large Libyan National Army (LNA) force from surrounding districts and Watiya airbase is reported to have chased an Islamist militia out of Sabratha. The sequence of events is unclear but they seem to have been triggered by the pro-Hafter demonstration in the town on Friday, which was described by Sabratha Municipality as “despicable”. Some 500 LNA-linked forces from the Watiya airbase and nearby towns, possibly including Al-Jmail, Rigdaleen and even Zintan, clashed with the Al-Amu militia led by Ahmed Dabbashi, a member of a prominent local family with a record of Islamist support. No casualty figures have emerged but the engagement ended with the Al-Amu militiamen pulling out of the town. Tonight they are reported to be 20 kilometres away, just west of the Mellitah Ol and Gas complex. Other local pro-Islamist militias are also understood to have quit the town and are said to be near Sorman and Zawia. It seems unlikely the LNA-linked force has occupied much of Sabratha, though a post with a photograph of a vehicle sporting a decal reading “Special Task Forces” suggested this possibility. The Islamist militias that have withdrawn are nearly all locals, even though they are unpopular in the town. Today’s events took place as the town’s mayor, Hassen Dhawadi, who clearly signed off on the “despicable” description of Friday’s pro-Hafter demonstrators, pulled off the political success of creating the Association of Libyan Municipalities at a two-day meeting in the town.